I don't know about you guys, but I have a death grip onto summer. As much as I have been complaining about the heat, I've been enjoying half day Fridays and sun-kissed skin. This has been the hottest and most humid summer I have ever experienced living here in St. Louis, and while I wish for snow while I'm sweating buckets, I know the logical side of me is not ready to give up my shorts and open toed shoes. This is also an awkward time for blogging. If I were a proactive blogger, I'd be sharing all of my fall cravings! But the thought of putting on knee high boots and blanket scarves right now for the sake of photos makes me want to throw up just a little! It's hard enough to not sweat while wearing shorts and sandals! I can't imagine adding more layers. All that being said, I'm going to hold onto my summer outfits and subsequently continue to share these looks on the blog for just a bit longer. Hopefully you don't mind! It was ridiculously rainy all day yesterday, which would make sense since I needed to take blog photos. #fashionbloggerprobs The show must go on for the blog, so luckily we were able to take advantage of the local Madison County Transit bus stop which has a generously sized covered walkway where we could be protected from the elements. I'm digging this combo. 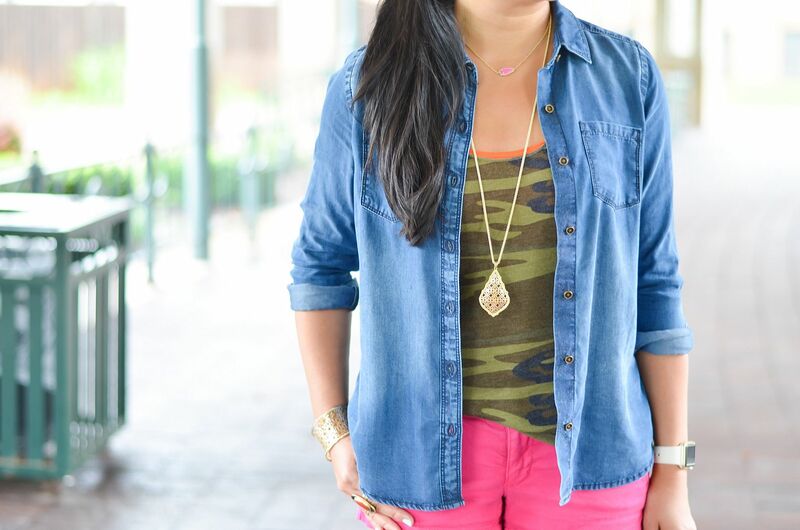 Camo and pink pair so well together and the chambray acts as the glue to seal it all together. The chambray also serves the same purpose as a cardigan when I'm indoors and trying to regulate my body temp with the frigid air conditioning. Chino shorts are my absolute favorite to wear in the summer. I have several colors, and luckily I never got rid of them because they're all fitting me again! It's refreshing! I just got a hair cut last week. I'm pretty sure it's been a good 8 months since I've had a trim. It wasn't really intentional - I had an appointment back in April, but it was the weekend before a good friend's wedding and I wanted to keep my hair long so I just had her trim my bangs. The next appointment was scheduled for sometime in June but she had to reschedule on me. But then I had to reschedule on her because of a conflict that came up which pushed my appointment into August! Once again the cut was scheduled on the heels of another wedding, so while I did have her trim the dead ends, my bangs, and my layers, for the most part she kept the length. My hair hasn't been this long in forever. She literally had to get down on her knees to cut my ends! On the upside, my long sideswept bangs are in a good place right now, I'm loving them. I just wish they didn't grow so fast!!! Outside of that, thanks for all the well wishes last week on my crazy schedule! I survived my overnight trip and I think I'm finally all caught up on my sleep! This week is going to be a bit of a whirlwind. Remember the bachelorette party and bridal shower? Well, the wedding is this weekend so I have the rehearsal to attend on Thursday, the bridesmaids are staying with her on her wedding eve Friday night, and then the stylists come for hair and makeup at 8am Saturday morning! I'm taking Thursday and Friday off of work to mentally prepare and get some last minute wedding stuff done. The short week will be great, though I know this weekend's festivities will be so busy, the time off will just be the calm before the storm! 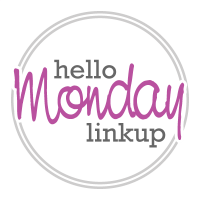 Hope you all have a fabulous week and don't forget to link up! I am totally flipflopping between summer and fall styles too, some days I wish fall to get here sooner and other days I still want to bask in the warn summer rays. You look stylish and put together as usual even for casual look Rachelle. I don't mind the summer looks at all. No way am I going to be wearing scarves and boots any time soon and blogging has gotten too proactive. I promise there will be a time for those things and they will still be selling them in the stores. this combo is so cute, I need pink shorts in my life. Yes your hair is gorgeous, love the bangs. People who don't live in St. Louis don't realize how hot and humid it is. When we left there and moved to Chattanooga, people kept saying, "Why are you going south, it will be so hot?" But St. Louis is much more humid and hot! I love, love, LOVE this look!!! I want to copy it right now. I have everything but the camo tank. Love this summer casual look! The tan accessories are perfect with it. I hate the end of summer too. Gotta squeeze out every little bit! I also wont let go of Summer as much as I can - you look cute!!! Pink and camo never goes out of style, does it? You look fab! Happy Monday! I'm with you--I love looking at the fall items, but I'm holding on to the summer too. I do wish it would cool down just a LITTLE though :) Love this look--the pink and camo are such a fun combination! Loving the pink and camo! I styled a sweater for a blog post today and nearly died while taking photos. Summer is sticking around here for a while. Although I will admit I am ready for fall! Loving this look on you. Thank you so much for NOT showing me fall clothes right now. When I see pictures of other bloggers wearing tall leather boots and blanket scarves in the middle of August, I want to be sick. Summer is short enough as it is, I don't see the point of making it any shorter. Love your outfit. The chambray shirt is a great idea for layering. Love this cute summery post! I am willing summer to stay, as well. Although, my furnace kicked on this morning so that is not a good sign!! I love the camo with pink! And I am with you on Fall clothing...it is too darn hot to put on layers. I won't do it either. Although I am very ready for Fall. On the upside of continuing to post about summer outfits...the end of summer is when I need the most inspiration for summer outfits. Everything is old and stale by this point so new ideas are always welcomed! So keep showing summer outfits until it is actually Fall. I think most readers would appreciate it! So cute! I'm totally going to recreate this one. Love it! Visiting your hometown for a few days. I am so excited for fall but I will be holding on to every ounce of summer until it arrives!! I love Summer so much, but since we don't really have seasons here ( at least not like half the country does ), I often wish for rain! I'm really glad you are still wearing Summer clothes. I think it's odd when I see bloggers wearing Fall clothing when I know they are sweating their butts off! I refuse to do that unless a cold spell comes through! You look fab, I love the espadrilles! I am not ready for summer to be over quite yet either! I love the hot pink shorts with the camo! Super cute outfit, I love the mix of camo & pink. I love love LOVE your hair here!!! I love summer and fall fashion! So though I am sad to see summer gone I am looking forward for fall! The pink and camo are great together! I'm trying to hold onto summer also. I tried to shoot a fall look over the weekend and just about melted, so I totally understand. I hope your week is off to a great start! Same here girl! I'm committed to enjoying every last bit of summer! Your outfit is so cute I love all these colors together! These espradrilles are so perfect for summer!